Automate Everything Except Personal Seller Contact. You should do that. Jack Butala: Automate Everything Except Personal Seller Contact. Every Single month we give away a property for free. It’s super simple to qualify. Two simple steps. Leave us your feedback for this podcast on iTunes and number two, get the free ebook at landacademy.com, you don’t even have to read it. Thanks for listening. Jack: Welcome to our show today. In this episode, Jill and I talk about how to automate everything except personal seller contact, maybe the most important piece of all of this. Before we get started, Jill, let’s take a question posted by one of our members on Land Academy’s online community support group. Jill: You’ve got it. Michel asks, I have a 36-acre property the seller agreed to option. I’m going to use the form in the program, our program. As a seller, since it’s not actually mine, how do you market it when you get the question from potential buyers who do some research and see the deed is not in your name? Good question. Jack: You’re more qualified to answer this than I am. Jill: For starters, you might actually own the property and have owned it for even six months and it still might not show in their name. Jack: The property, it never shows in your name in our business. We sell it so fast, the assessor can’t keep up. Jill: Exactly. That’s exactly right. Some of the counties, they’re faster and some of them are really slow and some just have a system, so don’t even worry about that. Jill: I just explain it to people and they’re good with it. Jack: Give us the speech, Jill. Jill: That’s exactly the speech. Jack: Even if you do buy the 36-acre property and then you start marketing it and you own it, it’s not going to be in your name for quite some time, sometimes two years. So what’s the speech when the buyer says, you don’t even own this property. Why are you selling a piece of property that you don’t even own? Jill: Like they say that. They don’t say that. Jack: You are a crook. Jill: You’re so gully. You know what? Jack, maybe that happens to you but it doesn’t happen to me. You know how they say it to me? They’re like, tell me again in that voice. Jack: Oh my gosh, Jill, you’re making me feel uncomfortable. You’re making my stomach hurt a little bit. Ooh, talk like that a little more. Jack: Give us a little pillow talk, Jill. Jack: Michel’s a guy, by the way. Jill: Yes, it is. Here’s why it’s not in my name yet. Jack: It would be cool if she was a she, though. Imagine that. I like this even more. Jill: Michel could be a man or a woman the way I do it. Are you a little tingly now? Jack: Man, this is my favorite show so far. Jill: I totally forgot about what the question was. Jack: What is this business that we’re in? Jill: I don’t know. I’m all tingly. Jack: All kidding aside, you have to have a little speech for this because it comes up a lot. Not a lot. It comes up once in a while, especially when you’re new and your internet presence is not like ours. Jill: Do you know what I do? Here’s what I really do, for real. In a very nice way, I don’t make my person on the other end sound silly or like they’re not smart but I say, let me tell you how these assessors work. Some counties are good and some counties are not good. The recorders even … It can take days, it can take weeks, it can take months. Once you really explain that, it’s good. I’ve never had a person come back to me and say, you need to send me a copy of the recorded deed ahead of time so I know you really own it. Jack: I’ve never had that either. Jill: They never do that. Once you just explain it, they go, oh, okay, and they move on. Yeah, I just got this. It’s awesome. You’re getting a great deal and, yeah, it’s going to take some time, and by the way, Once you buy it from me, it’s going to take a couple months but you’ll have a deed in your hand and we’re all good. They’re like, okay. Jack: Here’s your ace in the pocket on this topic. At the end of whatever speech you come up with, say this: But if you’re still uncomfortable, what do yo say we just open escrow. And you just close the deal through escrow. You can say, look, I’m optioning this property. I don’t own it, and I’m not representing the seller. Then explain an option to them. I’m going to buy it. You’re going to buy it. You’re getting a smoking deal but I found it first. Let’s open escrow. We’ll do a dual escrow. I want you to pay for it. It’s going to cost between five and eight hundred bucks, buyer, and let’s close the deal like we’re buying a house. I’m okay with that. Then, that takes all of the concern out of it .. it should if you present it properly, on the buyers’ part. Go ahead. Jill: That’s a perfect, perfect end of the line, bitter end example. I tell you, Jack, I don’t get to that point. I don’t have to. Jack: Because you’re good at this. Jill: Thank you, and I think Michel is too. Jack: And gosh darnit, people like you. Jill: Thank you. You just have to get to this point in this business where you have the confidence. You don’t want to offer too much information up front, so let me back up and help Michel here if you don’t mind. You’ve optioned the property and you’re all ready to go. For anyone just tuning in, what this means is, it’s a 36-acre property and I don’t have the cash sitting around, whatever we negotiated on, or I’m not really comfortable with the price so I don’t want to lay out the cash yet on what they want, so I’m going to do what’s called an option. We do a one-page agreement where it gives me 90 days and I’ll tell the guy, hey, here’s what we do. If you like this, I’ll see if I can get your eight thousand dollars or what ever it is. Can I have 90 days, and I’ll market it. I’m going to go out and market it all over the internet on all my places on my website, see if I can get your eight thousand dollars. If you’re in agreement, just sign this thing. Usually they’re going to go, heck, yeah, great. What I do, Michel is saying, how do I market it? The same way you always do. Jack: The same exact way. Jill: You don’t put, actually owned by Bob Smith and I have this one page agreement, see attached. You don’t do anything like that and you don’t have to, slash however, you don’t offer any unnecessary information. You’re marketing it as if it’s your own on your website. Everything is normal and great. Two days from now, someone calls you and expresses interest in this property. You’re not going to go, by the way, just so you know, it’s a option and da da da. You don’t need to volunteer any of that. Jill: Should they ask anything outright about it, you always are up front and honest about it. You just don’t have to volunteer any information. You don’t want to confuse people right now. They’re just asking about this deal. You want to talk about what it is. Jack: They want to buy the 36-acre property. Jill: For the twelve thousand that you just offered it for. Jack: Yeah, talk about that. Jill: They don’t need to know, oh, I’m buying it from this guy for eight. Oh really? They don’t need any of that, so it’s all good. We come back to cars a lot, but in a car dealership, I never know what the dealer paid and I’m still feeling good about the transaction. I don’t usually buy a car from a dealer, but that’s another thing. Jack: Concentrate on the land or the house or whatever you’re selling. Jill: You’re doing everything right, Michel. Market it exactly as if it’s your own. Don’t offer any unnecessary information up front, but if they ask, you are totally honest. Jack: I have to say this and it’s super important. Please do not represent the seller if you don’t have real estate license. Even if you do have a real estate license, don’t say that you are representing the seller because you’re going to get a lot of compliance problems, legal problems. You’re the buyer and you have to go through with the acquisition and you have to go through with it on paper, with a paper trail. If you need details about this, that’s beyond the scope of this, the actual mechanics of doing an option, go onto Land Academy’s online community and ask questions there because we have multiple people in our group that are doing them right now like in real time, so they will walk you through the whole thing. Michel is actually .. he’s done a lot of deals. Jill: One thing .. this is good for me. Anyone who is thinking about getting into this business, because I talk to those people a lot, they think that they have to have a lot of money in the bank to be a real estate investor. This is one of the ways that a lot of our folks have got their feet wet and got the ball rolling and had some acquisition funds by jumping in, learning the business, and they don’t have a lot of cash to outlay to acquire the properties, but ding, ding, they can do an option. This transaction I just described, if this had gone through, which it often does … look in our online community … this person has four thousand dollars in the bank. Now they have their own cash to play with. Do that again; now you have eight thousand dollars. Do that again; now you have twelve thousand dollars. That’s how you build up your acquisition fund. That’s why so many people have said, Jack and Jill, you guys saved me. I didn’t know I could do this. I thought I had to have a hundred thousand dollars in the bank to even think about being an investor, or take out a bunch of loans. No you don’t. Jack: The real value in all real estate, from mom and pop all the way up to Donald Trump, is finding properties that are undervalued. That’s your job here. Manipulating data, send out a bunch of offers, and locate a property that you have control over for half of what you think you can sell it. If you have no money at all, go out and do that and then bring it to our group. Somebody in our group … because there are tons of people in our group that have tons of money, they’ve been doing this for a while now … they will do the deal with you. Hopefully, it’s acreage or a house or whatever. Mark it up five, ten thousand bucks, split it with somebody in our group, maybe us even. That’s how they learn. That’s the benefit of this. You don’t have to sit in your basement and do this yourself and you shouldn’t, actually. I said it yesterday: find a group. Find a support group. It doesn’t have to be us. I know this because that’s how it happened with me. Jill: I’ll see you in a few years. Jill: And I hand-wrote them all. Jack: I bought five properties and you guys are … great. When did you start, ten years ago? Good for you. Jill: My thing is, too, is this a business or a hobby? Do you really want to make some money? If you want to just do little projects like that, I get that. Maybe it is a hobby. I’m here to make some money. Jack: Yeah. That’s what this show is about. We’re about to get into it. Automate this stuff. Perfect segue. 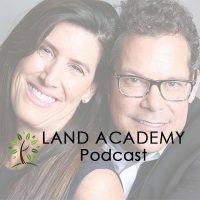 If you have a question or you want to be on the show, reach out to either one of us on Land Academy’s online community. Today’s topic, the meat of the show: Automate everything except personal seller contact. You know what would be cool, Jill? If you could walk us through the anatomy of a deal from start to finish. I call it cash in, cash out. Let’s use Michel’s 36-acre property. How do you even locate a 36-acre property? And then, let’s say you buy it. Can you walk us through from start to finish, or do you want me, too? Jill: I’ll jump in here. These shows are unscripted, folks. Jack: Oh, really? We couldn’t tell. Jill: I love when you … it would be like, Jack, let’s talk about designing a dress and I want you to tell me what patterns look like and what a pattern is. I feel like I was a little bit thrown under the bus there. I don’t know how much details you want me to get. Jack: My shins are bruised from getting kicked under the table. Jill: No, if you start me off and tell me how much detail you want, I can talk about the anatomy of the deal. Jack: I’m going to do the anatomy of the deal from start to finish, and we’re going to talk about what can be automated realistically and what shouldn’t be or couldn’t be for the whole thing. You get a bunch of data from a database, not from a list. Access a data base and you download the data, scrub it all out for the stuff you don’t want in there. Take all the skyscrapers out. In our case, for land, take everything that’s got an improvement on it. Scrub that thing down and send the data to a printer. Choose one where you don’t have to do a mail merge, where you don’t have to do the work yourself. You don’t want to learn how to do that. Don’t get hung up on that. So far, we’ve got one task: downloading and scrubbing data. You did that yourself, and you know what? You should do that yourself. You shouldn’t outsource that, so the title might be a little bit misleading. Whatever. Now you send it to a printer. That’s an outsource. That’s automated. They do the mail merge for you and they get it in the mail. They get all these offers in the mail for you. The property owners receive the offers in the mail. They open it. Some of them call you back or they sign it and send it back. So far, you’ve done very little work. Now you have sellers contacting you. You’re not out there contacting sellers and you want to be in that position, always. Seller X calls you or sends back the 36-acre offer for three thousand dollars, let’s say, and the seller says, I want to sell you my property. What do you do? Jack: You buy it and you make that seller feel like a million bucks all the way through. Jack: This is key to your real estate career. If you flip apartment buildings, same thing. Make the seller feel great. Jill: This is the turning point. This is it. This is what made you and I … at least for me … so successful in this business, is this key piece right here. I have had people call me back and give me a chance … like, hey, I actually got another offer. I like you. You know what? I do want to sell. I like you. There’s something right there, the magic that happens, Jack, that you can’t automate, but you can do everything else. Jack: Exactly. Plus, they might have other property. Jill’s an expert at that. Or they might know other people that have property. You make your money when you buy it, not when you sell it. I don’t say that often enough. Somebody was really impressed by that saying. I just think everybody has already heard it. You make your money when you buy these properties, not when they sell them. Hen you buy them so cheap, they’re going to sell the next day. Jill: You know. We already I know what’s going to happen. People look at us like, how come you don’t get excited when people check out and the money comes in? I saw that was going to happen. I knew was going to happen. I knew when I bought it how it’s going to go and how fast it’s going to go. Jack: Now the seller feels like a million bucks and they want to be your friend. You have two ways to close on the deal. You can close through escrow. We usually close through escrow on any property that we purchase for more than five thousand dollars, or you can do what we call a notary close where you send a cashier’s check and the documents to a local notary wherever the seller is, they go out and meet the person at a coffee shop or in their living room, sign the deal, hand the check over, and then you record the deed. That’s all automated. You don’t do any of that. The documents that got created, you don’t do any of that. You outsource that. You don’t want to push paper. That’s not the business you’re in. You want to be a data expert and you want to be a solid deal-maker. Great, so you own the property and the deed’s recorded. Now you’re going to sell it. You’re going to automate that process also. Every property is the same. They’re located in different locations, but the stuff that you do to get that property ready to sell outsource it. You don’t need to learn how to do all the maps and all that stuff. If you’re a control-freak kook, and a lot of our members are, you can take a crack at it. You can do it the first couple of times, but that’s about it. You want to outsource it. Jill: There’s a better use of your time. Jack: Yeah. You need to have a website already developed long before you send these offers out where they can click on it and buy it, just like it’s a pair of shoes. Now you’ve done no work. While they are clicking on it and buying it and putting money into your bank account automatically, you’re already on to the next mailer. You only do really two things. You scrub data and talk to a seller. Jill: You know what’s funny about that? I jut thought of something really interesting. I keep seeing this pop up. It popped up on our weekly member call last week, where our members are running out of inventory. Jack: There’s no issues with sales. Jill: They bought a bunch of stuff and they put it out in the system and they waited to see what happened. They’re like, Oh, shoot! You don’t realize, it is a big system like you just said, Jack. Automate it, move on. Automate it, move on. Then you won’t have to worry about running out of inventory, but it’s a good problem to have. It’s like, I sold everything. What do I do now? I have all this money. Jack: Someone asked me recently. Okay, tough guy, big shot. Where’s all the property that you guys own. We don’t even post it anymore. We just email a list out and it just gets purchased. To remedy that, I’m actually going and putting all the complete sales we have on our Landsday website to bring some credibility because their point is well taken. I hope that’s clear. Two things over and over and over again. Two things. Scrub data and develop relationships with sellers. Join us in another episode where Jack and Jill discuss how to use information, that’s me. 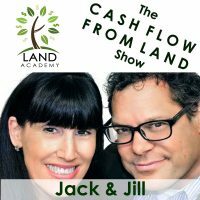 Jill: We use it everyday to buy property for half of what it’s worth and sell it immediately. Jack: You’re not alone in your real estate ambition. I think that was super clear. Jack: Usually I feel like poop after a show. I feel pretty good about that. Jill: You don’t look like poop. You look good. I like this look today. Jack: Thanks. You should raise your standards. Jill: It’s a little bit rainy today, and you’re wearing shorts just because you can. Jack: You know what I said to Jill recently. We’re here in Los Angeles. We live in a community where people walking down the street … I don’t know if they’re independently wealthy or homeless because everyone looks kind of the same. Jill: It’s great! That was so funny. Jack said, that’s what I aspire to be. I want people to question, he’s either retired or homeless. I’m not sure which one it is. Jack: I think I’m pulling it off.